I’m looking out the window on the flight from Houston to Denver, the second-to-last leg of our return trip from Patagonia. Soaring over what I think are the hills of West Texas, I reflect back on my time in Argentina. Friends, new and old, are the first thing that come to mind. Joaquin and the Colorado boys; Julian and Sandrine, whom I hope to visit in Bariloche and Chamonix; Kate, Mikey and Madaleine; Fede, who hosted us in Buenos Aires, and Gabi, who toured us around the city; Colin, Jon and the other Canadians we met in the Torre Valley; the Kiwi trekkers; the Germans and Russians we met at Paso Superior; Sergio, Santiago and Lucrecia, the family from northern Argentina we laughed and partied with at the hostel (pictured at left wearing Josh’s ski goggles); the Kauffman brothers and Malu. But most of all, my patient, optimistic, solid, beer-loving climbing partner Anne Gilbert, with whom I spent Christmas, New Year’s and nearly every other moment of the last month. She would want me to mention Elena and Gladys, the hardworking, kind women who ran our little hostel out of their home. Although they spoke no English, they had us completely figured out. Near the end of our stay, Gilbert overheard Gladys explaining how we’d been there a month climbing and didn’t want to leave. People come first. Then mountains. I open my laptop, and Poincenot, Saint-Exupéry, Rafael and De la’S throw long, pointed evening shadows across the robin’s egg green Lago Sucio and the effervescent Laguna de Los 3. Gazing at this photo, I try to stretch those shadows a few hours farther in my mind. It started on December 30, when Gilbert and I scrambled in the pouring rain down the slippery ledges above Laguna de los 3, past the sketchy old fixed lines. At the glacier we switched to boots and headed into the fog toward Paso Superior. By 5:30 p.m. we were soaked and tired, post-holing to our thighs on a 45-degree slope. Over it, we found a flat spot on the ridge, stamped down the snow, staked the tent out with our ice tools, and climbed in. Brewing hot water, we dozed, giggled and shared Gilbert’s iPod. At 7:30, after we’d eaten a Mountain House and some multi-colored sugar candies, we heard voices. We set the alarm for 2:30 a.m. to check the weather: fog. 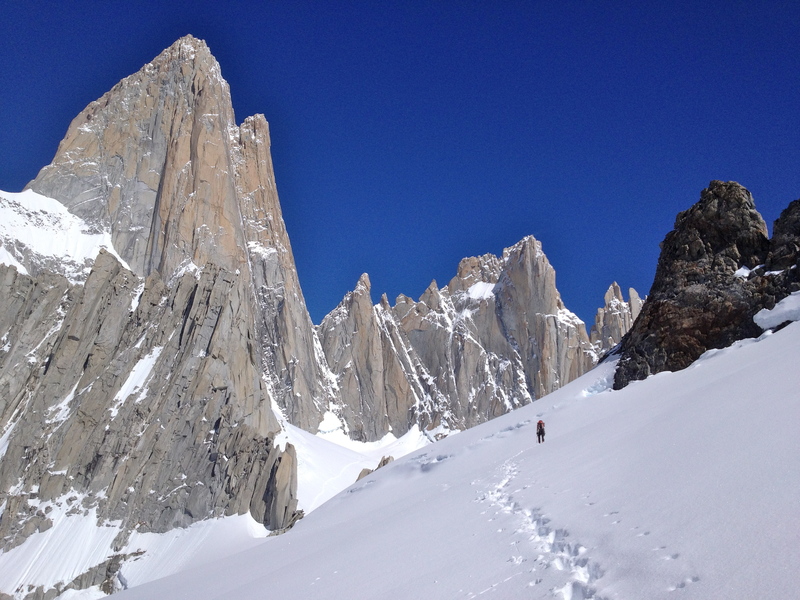 The Whillans route on Poincenot, which we hoped to climb, would need a day to shed the new snow, so we slept until sun and deep blue Patagonian skies drew us out for coffee. 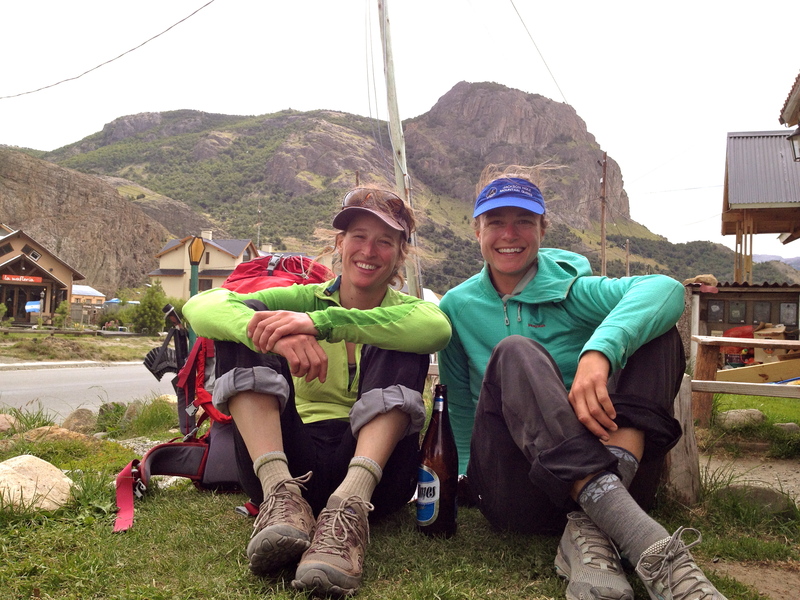 After a 35-minute hike to Paso, we spent the day drying our stuff out, chilling and socializing. First we met Pavel and Bryan, of Boston, who were out of fuel and headed down. 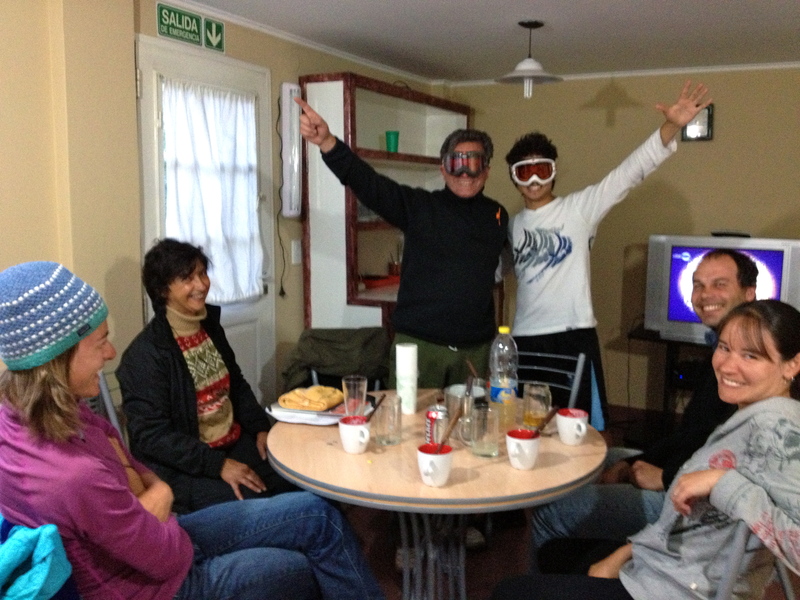 Next, three Argentines, Fede, Rocke and Santiago, were rolling porros before attempting Fitz. Celebrating New Year’s Eve at 4 p.m., we sipped Irish whisky and Scotch with the Colorado boys and two German scientists. At 7:30, champagne and furry pink cookies with Igor and Gena, of Russia and Kazakhstan. ¡Festejar! After dinner we ran out of fuel. The storm had lasted longer than we thought, adding on this extra day of chilling, which led to the shortage. Damn. We were frustrated, but luckily we still had enough water to climb the next day. We woke at 2:30 a.m. and were headed up the frozen glacier toward Poincenot by 3. At the bergshrund we tunneled through a cool hole in the snow, climbed an ice step, then crossed the snowfield in the alpenglow. Justin and Chris had bailed from their attempt on the California Route because of bad conditions and were already headed up the snow ramp above. We simul-climbed the snow ramp, me leading as fast as I could to get off the thing before it got too warm, clipping fixed tat like it was a sport climb. Gilbert crushed the crux mixed pitch, and off we went, trending left and up on cool moderate rock in our boots. At 2:45 p.m. (or was it 3:45?) we took turns standing on the summit. 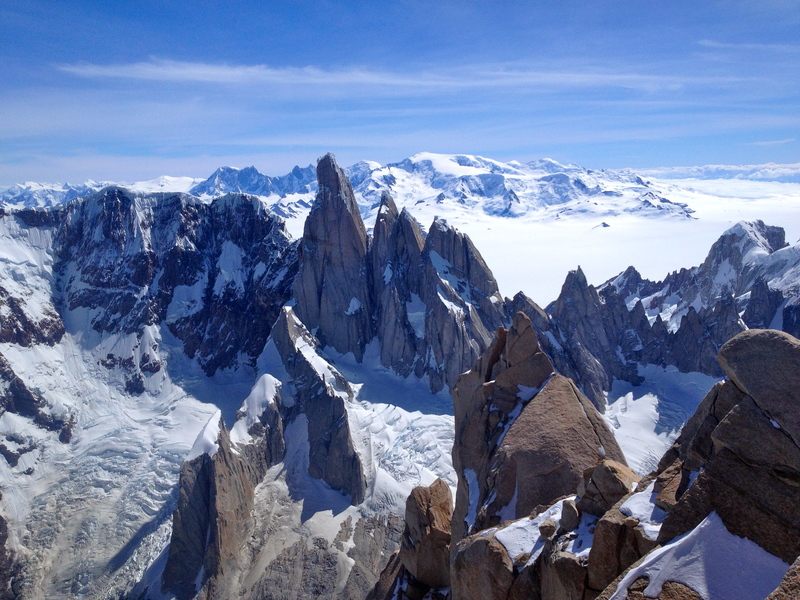 The views: in the west the Torres and Patagonian ice cap; Lago Viedma and the steppe around Califate to the east; mountains north and south as far as the eye could see. We descended with the boys, Gilbert leading most of the way. 16 rappels later and a lot of goofing off, we were booting across the glacier, post-holing through breakable crust on our way back to camp. We stumbled in at 11:45 p.m., peaks in black shadow cutting through the starlit sky. Igor and Gena were already back, snoozing in their snow cave; the Germans gone. Looking up the glacier behind me, I saw four headlamps approaching – the Colorado boys and two of the Argentines. 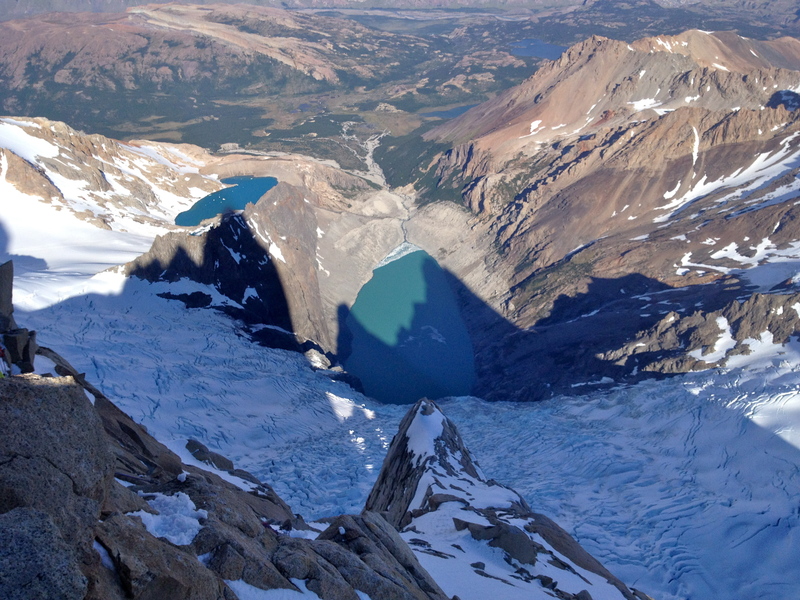 This entry was posted in Climbing, Mountains, Travel and tagged Patagonia, Poincenot. Bookmark the permalink.